ECOlogic Natural Fruit and Veggie Wash is recommended for washing conventional and organic produce. This environmentally friendly wash is effective for removing manure and soil as well as wax, pesticides and herbicides. 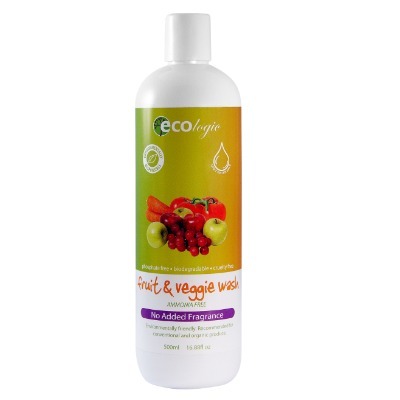 This product Is sewerage safe and suitable for all produce types..
ECOlogic Natural Fruit and Veggie Wash is recommended for washing conventional and organic produce. This environmentally friendly wash is effective for removing manure and soil as well as wax, pesticides and herbicides. This product Is sewerage safe and suitable for all produce types. Fill a sink with cold water and add a small amount of ECOlogic Fruit and Veggie Wash. Using hand, scrub off chemical residues and soils. Rinse with clean water and pat dry with paper towel or cloth. Purified Water, Coco Betaine, Alpha Olefin, Celtic Sea Salt, Coco Glucoside, Citric Acid, Potassium Sorbate, Parfum (Natural Preservative), Organic Saponified Coconut Oil & Organic Saponified Olive Oil, Horsetail Extract, Organic Lavender Extract, Witch Hazel Extract.